The gardens at this Asheville bed and breakfast are constantly changing....and as such, are a constant source of fascination. And what could be better than flowers that are beautiful and striking in the garden, but also that they attract hummingbirds? 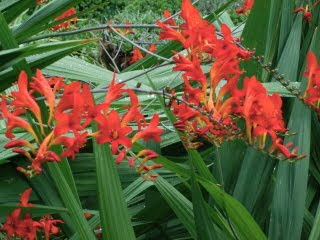 Well, these red hot lilies are called Crocosmia and "Lucifer" is the red hot variety! These lilies have been blooming for a while now. 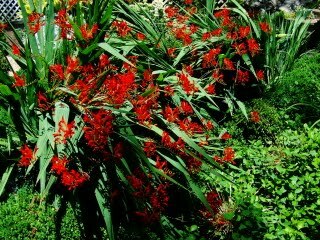 They have fronds that produce bright red multiple blooms. They start blooming at the stem end and move forward toward the tip, until it's all in bloom. 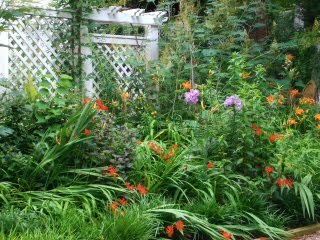 And, as I mentioned, one of the very best things about Crososmia is that hummingbirds love it. So, if you sit quietly as these lovely booms are nodding in the breeze, the bonus is that a little 'hummer' may come along. And although the hummingbirds are not found on our guest register at Abbington Green Bed & Breakfast Inn, they are an added attraction for the lucky guests who are in the right place at the right time! We hope we'll see you soon!